Welding – it’s an extremely rewarding and exciting job as welders work with heated metal and fire daily. Also, there is a shortage of welders all over the country which means that it’s easy to find a job. Do you feel like becoming a welder? If yes, we’ve prepared for you a list of the best welding schools in New Hampshire and some useful tips as well. 5 Where Can Certified Welders Work in New Hampshire? Welding – it’s a process of joining metal pieces with the help of heat. To make it, you need to use various equipment that heats and melts metal. As you understand, you should be really skillful. Working as a welder, you’ll have something you can be proud of as the results of your hard work will be seen for a long time. You are going to create amazing constructions such as bridges, buildings and so on. Also, this career is an absolutely great choice for people who like working with their own hands. You’re going to work in open air daily. One another significant reason is that welding has a big outcome. According to the U.S. Bureau of Labor Statistics, job offers for welders will increase by 6% in the nearest future. An average median salary of a welder in New Hampshire is about $45 560 per year ($21.90 per hour). At the same time, a median salary throughout the country is about $39 390 per year ($18.94 per hour). The top 10% of welders in Nevada earn about $63 135 annually which is slightly more than a national salary. In fact, the top 10% of welders throughout the USA earn about $62 100 annually. Where Can Certified Welders Work in New Hampshire? 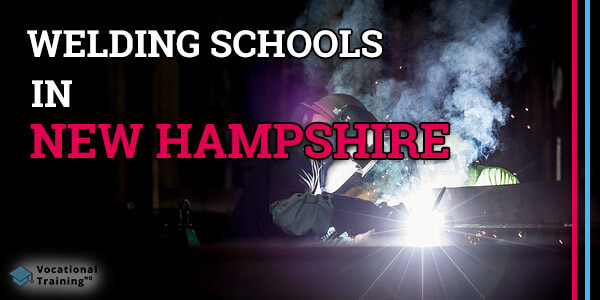 Below there is a list of the best welding certification schools in New Hampshire.